Good Morning Everyone! Are you ready for another Tuesday Tool? Well today, we will talk about the Watercolor Pencils. You can use them alone to color stamped images or use them with a blender pen, watercolor brushes or Aqua Painter for beautiful effects on your project. They come in 24 assorted colors and are packaged in a sturdy tin container. 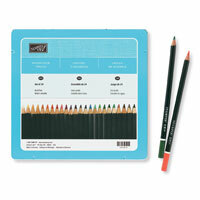 If you would like to order the Watercolor Pencils, click here. Happy Stamping!